I like Viceron but I somewhat agree with Soundwarp that it is not very clear what his SA is doing, thematically, other than draining him. I can see the dislike for Unholy Sacrifice, but it doesn't bother me too much. I just assume he's cutting himself in some ritual. Overall the design is fairly interesting. Hmm... An interesting criticism for the power name and one that I can see. I believe I have made my theme statement quite clear in what it is doing, but ideally that would extend concisely onto the card. Since this is one that I personally agree with, I wish to formally withdraw my submission for Viceron the Blood Knight and workshop the power name on another thread (this isn't the place for work-shopping). I suspect he'll be coming back soon. Ok. Viceron the Blood Knight has been officially withdrawn. Thanks for taking the workshopping to another thread. Unless the Warden is powered by raw Marxism, whose electrical energy only sees fit to punish the hedonistic bourgeois while leaving the noble proletariat be, I'm just not seeing the theme in the Unique only restriction compared to the Mind Flayer. I was really just setting him up to get the same treatment in the topdown as the comrades did in your game against Mega. Great review as usual SSG1. Thanks for the feedback. Man what do you think I do in the french forums? We were working on a 3rd card to submit (goblin unique squad to make the HSB+Goblin army playable) it was starting to be good but we got bored up because having his custom accepted takes too much time. And by the time it takes the units may not be still avalaible enough. You should finish it anyway. Sometimes what you should do and what you want to do is not the same. Seeing the time it takes to Asterios to pass (Seb found Asterios figure in November 2011, and we started serisouly to work on it about October 2012...). The time for us to finish the Goblin squad, and the time for you to review it, the SoV will be pretty much dead (if not Heroscape). Also we stopped working on Kheris after he had a NO as we still don't understand what was precisely the problem and we didn't know what to change without changing the original nature of the custom. So we choosed to not resubmit him and to keep him as he is. I believe the reviews discussed his issues. If you put him in any of the workshop threads I'm sure the relevant judges would be happy to share further thoughts and suggestions in greater detail. We discussed that already in the french forums as soon as Kheris received his no. I don't really want to redo the debate we had but some people (including me ofc) thought that your arguments (too complicated) and Superfrog's one (too random) were not justified enough. He's far less complicated than Varkanaans for example. And waaay far less random than Brimstone (which is one of the most random figure in the entire game) or at a fewer extent than Quahon. Kheris needs at least 2 Nnah Scirh Shield rolls to win against the stuff he's not supposed to which is Sharks, or really big defense against common squads (or poor attacks from them), Quahon needs only one big LBSA to win even against NSC (tested in a poor experience from my side). I don' say Quahon should be removed from the game (well I do but it's because of her sculp not her card ) but while Kheris can do big damage with some luck other figures can too, like Quahon for example and many others. So we did a vote weither re-modify Kheris and re-submit it or no, it was very close (never had more than 2 votes more in one of the answer). So we screwed up the vote and asked Dan weither we should do it or not. Dan said "ok if we don't denature him". We started to think of several things (but never got far as solving your and Superfrog issue seemed very hard for us) but in the meantime we were playing the current version in tournaments and games and it was going very well. So logically, we got bored up on trying to modify him and continued to use him as he was. He's doing very well both in tournaments and in more casual play. We have a lot of fun with him. No one complained about how frustrating it is to play against atm (special taunt ). If you want to try modify it, good luck and have fun, but we are very satisfied with the current version so I don't know why we should modify it. Last edited by Foudzing; November 13th, 2014 at 01:15 PM. Your biggest hurdle isn't going to be the powerset for Viceron but the figure you are using anyway. I'm certain you can tweak his card to better theme and wording. The figure you have is a rare D&D miniature from 7-8 years ago which is going to make it very difficult to find. Thank you for your concern, but I have found 93+ of them online. While it is a "rare" miniature in the set it was made in, I don't believe it was a terribly popular one. EDIT: Previous dumb post here. You'd have to prove that to me. I don't see it possible that there would ever be more than 50 unless someone has a huge cache of them. After some rapid work shopping (thank you to everyone at the SoV workshop thread), I would like to submit Viceron the Dark Knight for consideration by the SoV judges. Balance Viceron the Dark Knight is a lone hero with limited survivability, somewhat offset by his Sanguine Sword power. He is quickly outclassed in a head to head fight by many other melee heroes, but his true strength lies in his ability to face squads. 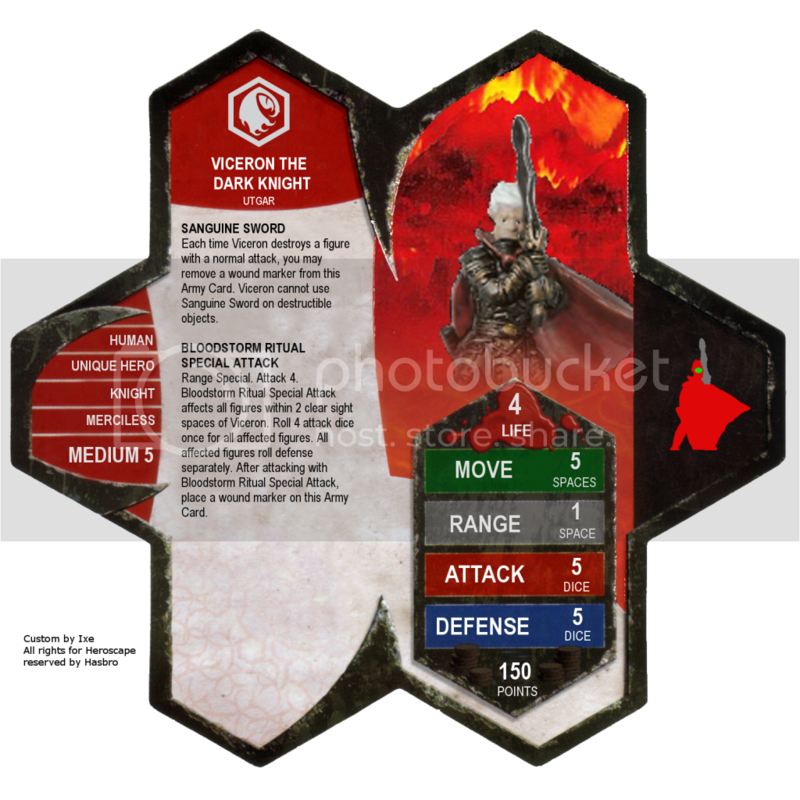 His higher defense can hold up better to typically lower attacks, Sanguine Sword will more readily trigger and, if he is willing to use his own blood to fuel an attack, his Bloodstorm Ritual can blast through low life figures. Playability The Thrall of Blackrazor is a prepainted D&D miniature and can function in Heroscape without any rebasing or further treatment. His powers are clear and are similar to existing powers. His master stats fit his size, type and equipment. His striking white hair and red cape make him visually distinct from other figures. Creativity Viceron uses life as an interesting resource that provides decisions throughout. Choosing to use Bloodstorm Ritual over his normal attack can at times be a 2 life swing, and his life is low enough that simply spamming his ability is not an option. While his blast is similar to that of Brimstone, the constant attack and life management make them play very differently. Theme Viceron the Dark Knight; hated and feared on his home world. He knows that there is no cost too great in the name of victory and is ready to use his own blood as a reagent to unleash terrible and powerful magic. He compensates for his sacrifices with his enchanted sword, capable of draining the life force out of those he slays and reinvigorating him. Viceron comes from the planet of Toril. Accessibility The figure is the Thrall of Blackrazor from D&D Miniatures - Unhallowed. They were previously abundant on abprices but the stock there has rapidly diminished lately (and made me worry). After performing a search, I was able to drum up 93 figures, not including paizo's stock. Fortunately for me I save my sources when I look into miniature availability. This is from 2 days ago. Note that there are 4 links for Mercado Livre. That site had 4 separate links for purchasing off of it, but only the vender's city of location was listed. Even without any of those links, there are still 81 not including paizo's stock. One concern with his design was his effectiveness in the Brunak-Ornak Slingshot. I have found that while the tactic has the potential to damage an opponent's ranks before they can leave their start zone, it is far from a dominant strategy. In addition to committing 360 pts to an army for essentially a single gambit, it is only viable on a few maps, requires winning initiative, against an enemy with a clustered enough start zone and then a sufficient attack roll to deal the necessary damage. I'm personally not worried about it. Last edited by Ixe; November 17th, 2014 at 03:40 PM. Reason: Added planet of origin.